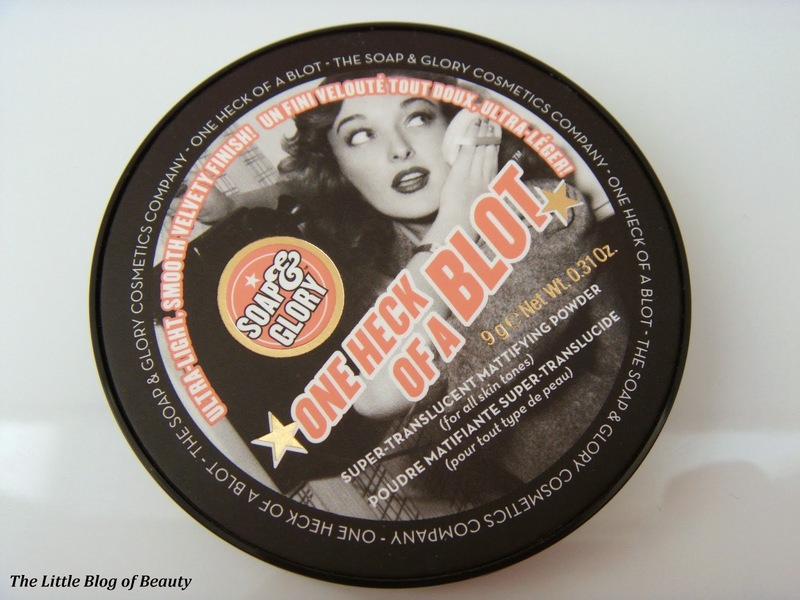 If you follow me here or on Twitter you may have noticed that I've recently become a bit of a Soap & Glory fan and I'm gradually working my way through trying every single last one some of their products. I had both One Heck of a Blot and Glow All Out on my wishlist, so when I spotted that Boots has an offer for two Soap & Glory makeup products for £15 a few weeks back I grabbed both. 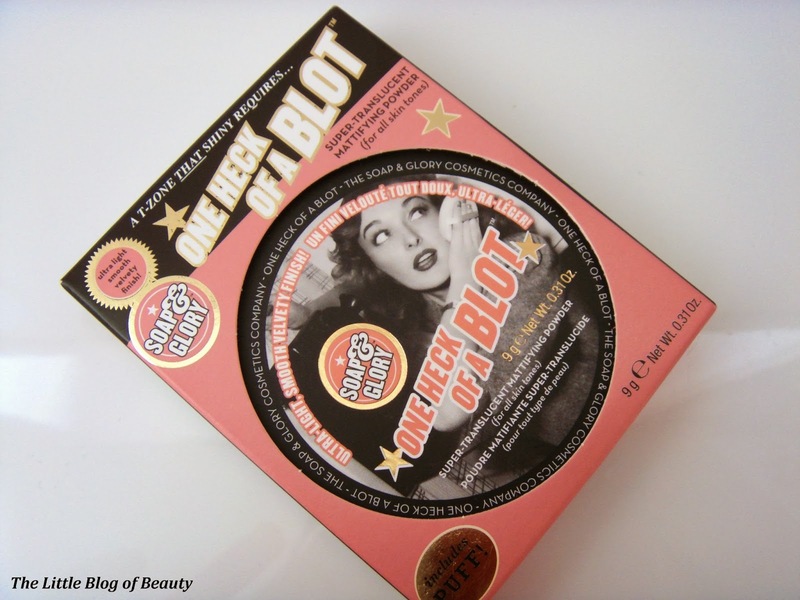 As One Heck of a Blot is £12 and Glow All Out is £11 this means I got Glow for just £3 or Blot for just £4 or both for just £7.50 each, depending on how you want to look at it. Bargain! As usual with Soap & Glory the packaging is quirky with some retro imagery. This comes in a plastic pot which feels reasonably sturdy and includes a large mirror, which is always good for touch-ups or just to have in your bag for checking teeth for trapped food emergencies. It says on the packaging that it includes a puff, but I would call this more of a sponge than a puff. Puff's are thicker and fluffier? More like what the lady on the packaging is holding, the sort of thing you might get with a loose powder. 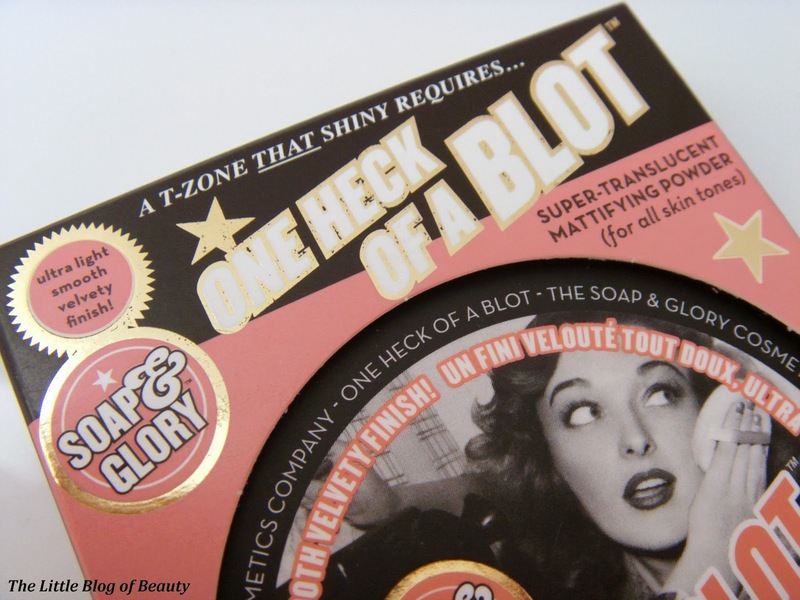 I believe Soap & Glory have just started introducing some new packaging for their body and skincare ranges but I'm not sure if the packaging of the makeup range will be changing as well. 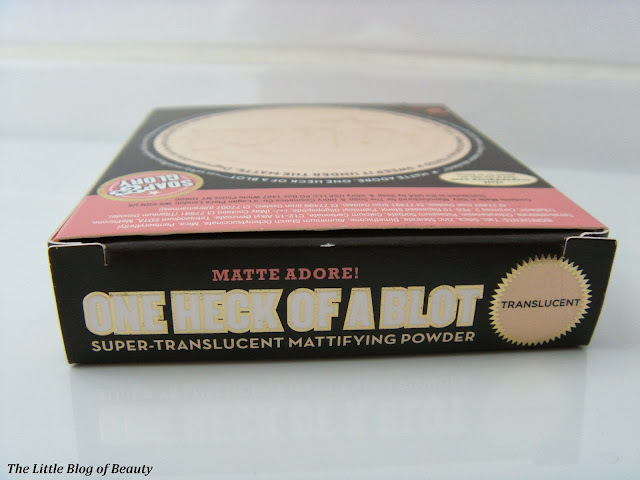 This is described as a super-translucent mattifying powder for all skin types and I had very high expectation of this after reading reviews from oily skin sufferers claiming it kept their skin oil-free all day. I used to suffer with oily skin when I was younger but as I've got older my skin has definitely changed and now most of my face is dry. For whatever reason my chin has remained oily and this is where I occasionally suffer from awful breakouts. 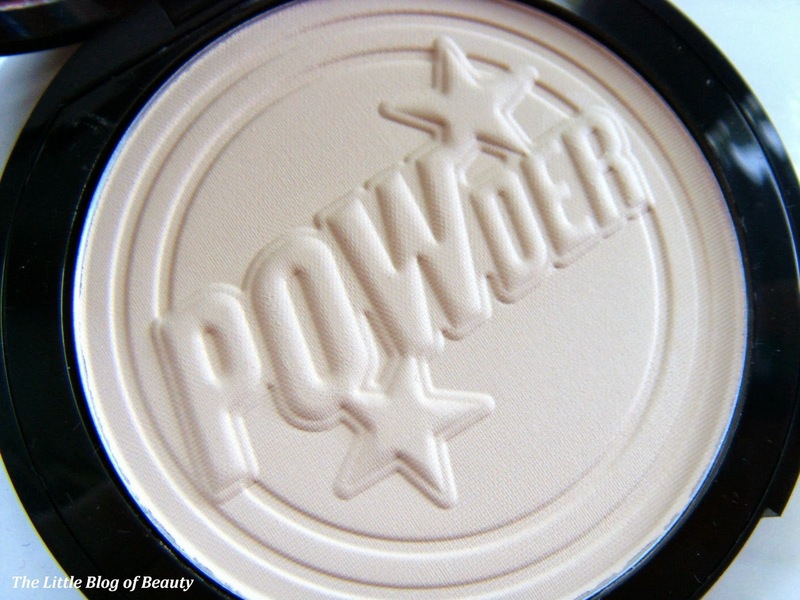 At the moment I usually use a powder foundation, so don't really have to worry about using a powder over the top, but I often find that within a couple of hours my chin has started to become oily and my makeup is slipping off. So I wanted a good powder to try and stop this happening and to help mattify liquid foundation when I do use it as I'm not really one for the dewy look. The first couple of times I used this I have to say I was slightly disappointed that it didn't take much longer than usual for my chin to become oily and my makeup to start shifting. However, the next couple of times I used this it appeared to work really well and my chin didn't become oily for much longer, if at all. So I'm not sure why sometimes it appears to work well and other times not so well. I've been using a brush to apply this but it does say on the packaging to pat it on, so I may try this instead using the puff/sponge. 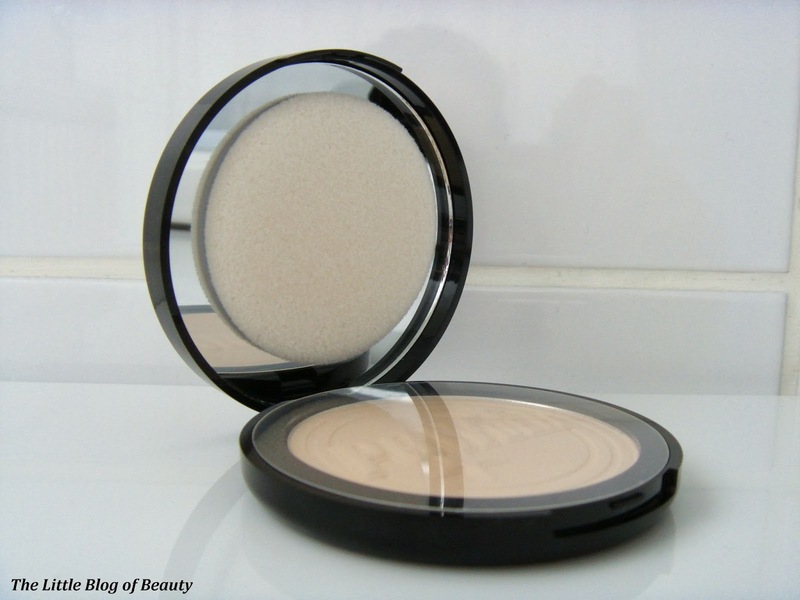 Even if this hasn't necessarily helped to solve my oily chin problems I do really like this as a powder. 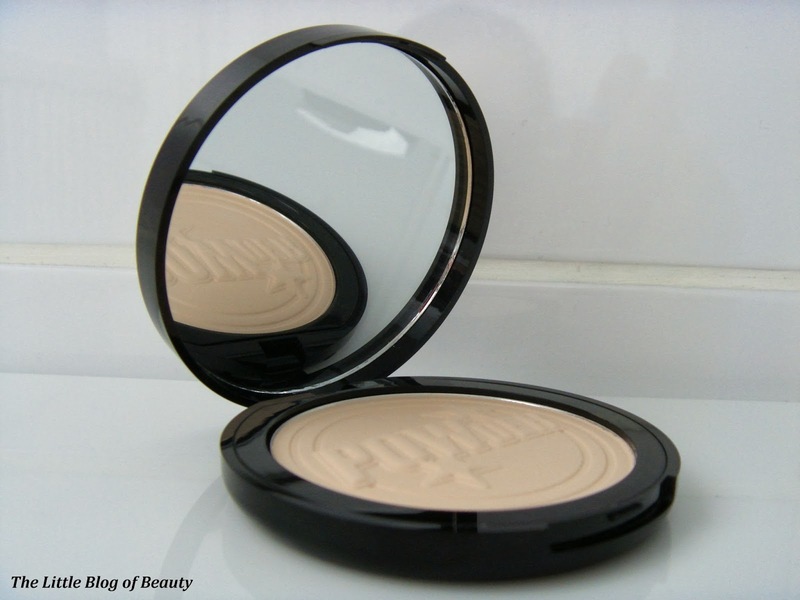 It really does set my makeup well and matte down liquid foundations and although it's translucent I also find it kind of tones down any foundations that are slightly too dark for me (super pale girl problems!). 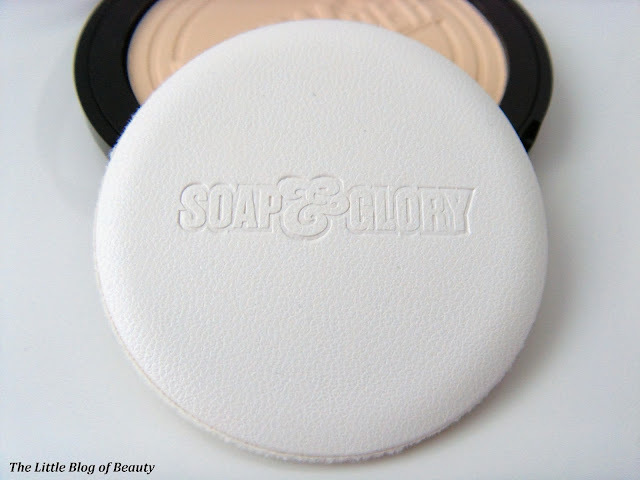 Are you a fan of the Soap & Glory makeup range? I love the S&G range, really want to try this!